Coldest Day of the Year = Time to Think TOMATOES!!! Our gardens are buried under half a foot of snow, the wind chill is below zero, the roads are treacherous…wipe all of those thoughts out of your mind with the realization that April is just around the corner! As always, I’m going to have an INSANE amount of varieties of tomatoes this year. I participated in a seed exchange and have about 80 different types of tomato seeds I plan to sow this year. MANY of them will be in super short supply as I only have around 10 seeds for several types and those will be offered on a first-come, first-served basis when you pre-order plants this year. I’ll post the complete list of varieties in March, so stay tuned! As in years past, I ask that if you have a particular type of tomato or pepper you’ve grown in the past or have a yearning to try out a new variety, please let me know via e-mail or a comment here and I’ll see if I can find seeds for that type and have seedlings ready for you when you’re ready to plant. Here’s a few pictures from seasons past to keep you from going completely crazy in this winter wonderland! 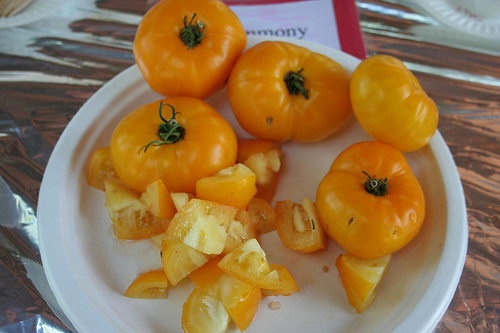 Bush Beefsteak, Patio F Hybrid, and Micro-Tom can all be grown without stakes or cages. Roma VF, Bradley, and Red Alert can be grown with stakes and a little tying up, but don’t need sturdy cages. All of the rest are best grown with STURDY cages or heavy stakes and lots of pruning. You can also grow any tomato on the ground and let it sprawl. We used to do this when I was a kid and we had a lot of tomatoes. You need to put straw under the vines so they don’t get muddy and this reduces some diseases. You also have more damage from rodents and snails and slugs. It’s harder to harvest and not as aesthetically pleasing, but growing on the ground is a definite option to buying cages. The WORST thing you could do though is to support large tomato plants with a flimsy cage. This is a recipe for disaster as winds and heavy fruit load will cause the plant to fall in the summer and likely kill it.